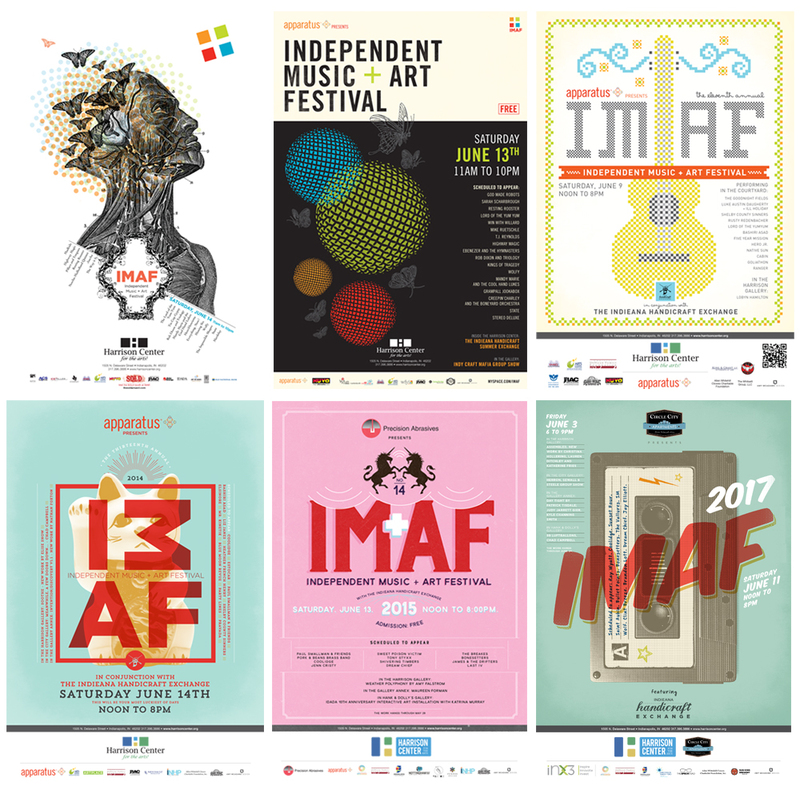 Sorry for the Ye-referencing headline, but it seemed like as good a way as any to get into this post, which is a celebration of 10 years of designing posters and promotional materials for one of our favorite annual arts events in Indianapolis: the Harrison Center’s Independent Music + Art Festival—also known as IMAF. IMAF—a spirited all-day celebration of exactly what its name implies—is held in conjunction with the equally awesome Indieana Handicraft Exchange (another Matinee-branded event). The programming and performances are top-notch, and the indoor/outdoor nature of the two events makes the Harrison Center one of the most attractive destinations on a day that includes a lot of strong options in Downtown Indianapolis (like the Talbott Street Art Fair and Brew Ha Ha). But we love IMAF the most. Not just because it pegs the Funometer®, but also because the folks at the Harrison Center have consistently given us a refreshingly long creative leash. We’ve been designing materials for the event for 10 years now, and we look forward to it every. single. year. In the past, I’ve caught myself writing “It’s an honor to work for [such-and-such client]” and thinking to myself, “Really? ‘An honor?’ What are you, a squire?” But in this case it feels right and true, so screw it: It’s a straight-up honor to work with these people, on this project, year after year. Now allow me to bid thee farewell, as I must don my chainmail for the Renaissance Faire.